Live VR performance Sacred Environment is commissioned for the concert hall and explores the changing meaning of sacred ground in our demythologised society. 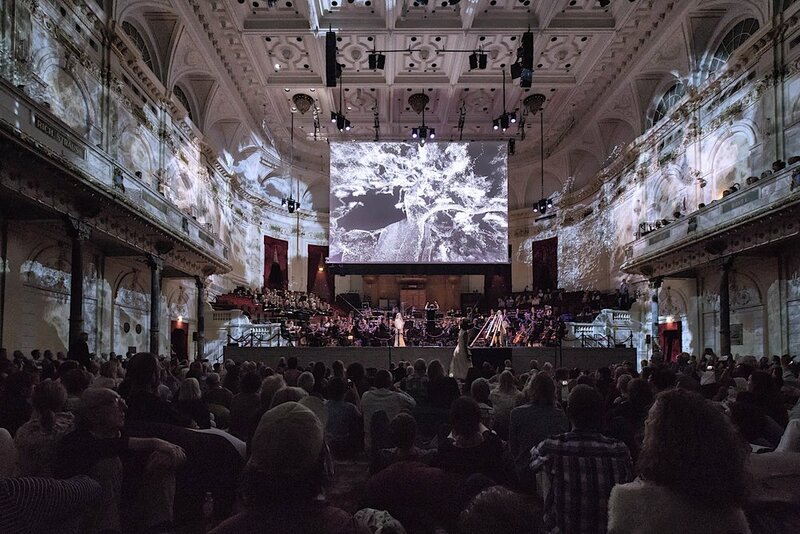 Sacred Environment is a ground-breaking work by the Dutch-Australian composer Kate Moore and visual artist Ruben Van Leer, commissioned by the Holland Festival and NTR Radio, premiered in 2017 at The Concertgebouw Amsterdam. The oratorio was performed and sung by the Netherlands Radio Philharmonic Orchestra, the Netherlands Radio Choir and soprano Alex Oomens. VR performer Esther Mugambi goes on a virtual reality dream-track towards the Hunter Valley in Australia, originally the territory of the Dharug, Darkinjung and Wonnarua people. The audience will follow her on a big screen in search of the stoneless temple. In this piece, the changing meaning of sacred ground in our demythologised society is being explored.